As I write to you, I am thinking deeply about MICOP’s first steps as a grassroots organization and how much we are growing. Nearly 15 years ago, our founder Family Nurse Practitioner Sandy Young and volunteer leaders started MICOP without an office or staff, but with a dream of making a change for our county’s indigenous immigrants. With this last newsletter of 2015, I would like to send you a full list MICOP’s current programs and community efforts to give you a sense of how we are making that original dream into a reality. I hope that reading this list fills you with the same gratitude I feel for the hard work of MICOP’s volunteers, staff, agency partners, Board, funders and donors. You will surely see your own participation in this list—thank you for all you do. 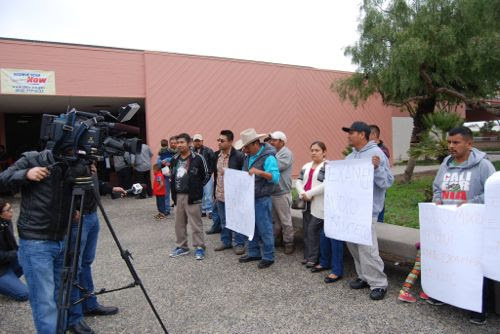 I invite you to make a donation to further advance our work of aiding, organizing and empowering Ventura County’s indigenous immigrant community. Click here to donate. May we all be inspired and hopeful as we look to 2016 to be another exceptional year! 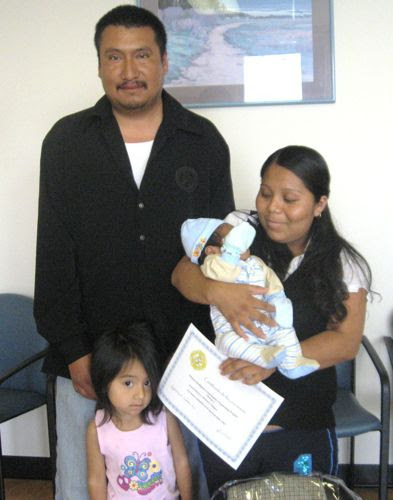 Tequio Scholarship: MICOP has established a competitive college scholarship for indigenous immigrant youth. Learn more here! Respecto es Paz: MICOP developed a 6-session multi-age curriculum to teach students about indigenous culture, language art. Please see the curriculum here. 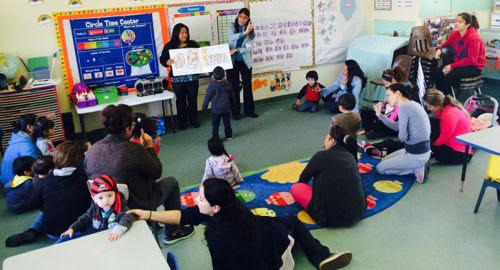 Aprendiendo con Mama y Papa classes: Parents and toddlers learn together to read aloud, sing and dance, make art, and practice vocabulary in three languages. 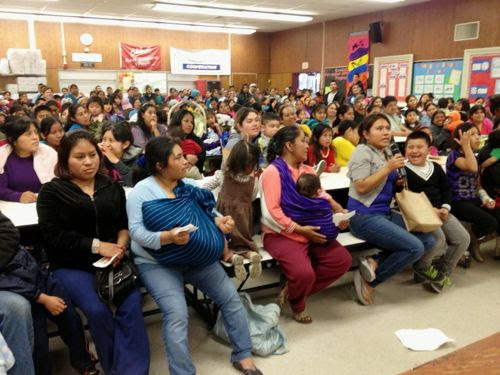 MICOP’s Monthly Community Meetings: Over 200 families gather 17 times/year for a basic needs distribution and to learn important community information in Oxnard and Rio. Indigenous Knowledge Conference: We welcome 180+ participants from local agencies and schools to learn about the indigenous immigrant community. Cultural Awareness Presentations: MICOP teaches community partners about our culture, language, and history. Let us know if you would like us to visit! Tequio Youth Group is now in its fifth year! Our team is working with area schools to improve services for English Learners, and to provide tutoring younger indigenous students. Twenty youth visited UC Santa Cruz this fall! 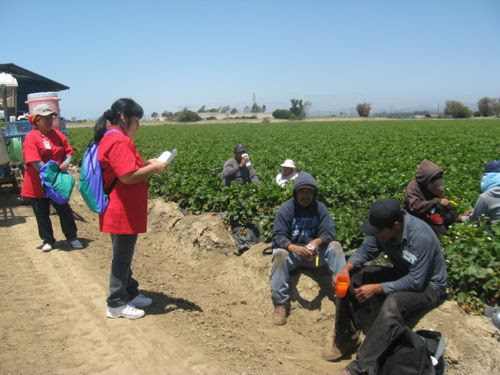 Labor Justice Campaign: MICOP is mobilizing indigenous leaders to create safe and sustainable work environments for farmworkers. Indigenous Leadership Institute: Training community leaders to organize campaigns and create social change, like our successful 2015 DMV language access campaign (above). Central Coast Immigration Reform Coalition: MICOP partners with area agencies to advocate for immigration reform. DACA/DAPA outreach: We are helping families prepare for the anticipated summer 2016 launch of immigration reform. Indigenous Language Services: We now serve over 30 agencies in our area with excellent Mixteco and Zapoteco interpretation services. Partner with us for interpretation! Expanding Access to Affordable Health Care and Coverage: We work with medical partners countywide to improve our county’s safety net. Bebe Sano Classes are MICOP’s oldest program. Parents learn US-based medical and safety for babies including use of thermometers, administering medicine, and carseats. Health4all Kids outreach: MICOP will begin sharing the news that all income-qualified California children will now be covered by Medi-Cal, and will help families enroll. Health Education Promotores: Our team of trained educators keeps the community informed on health issues and updates. Entre Hombres (Among Men): Our team of 12 trained male promotores educates men about preventing domestic violence and alcohol abuse. Living with Love is an 8-session curriculum teaching evidence-based mental health tools and healthy communication techniques for families. MICOP also provides one-on-one referrals and support. 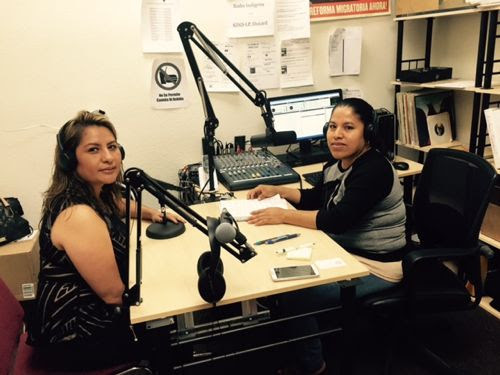 Voz de la Mujer Indigena: MICOP trains survivors of domestic violence to be community leaders, artists and radio DJs, inspiring women to move away from abusive environments. Conexion con Mis Compañeras promotes mental wellness among Latinas with Ventura County Behavioral Health. 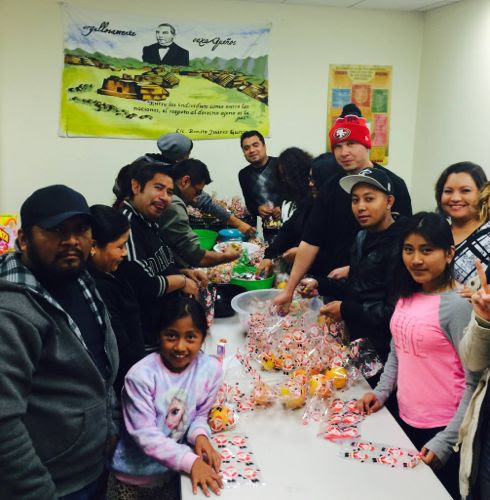 MICOP’s monthly Community meeting and distribution; Volunteers preparing Christmas aguinaldos (traditional Oaxacan bags of sweets) for distribution to kids at our December meeting. Puentes: Mixteco- and Zapoteco-speaking case managers serve over 800 families each year at First Five Neighborhood for Learning centers in Oxnard, Rio and Hueneme. We are teaching Triple P parenting classes and performing developmental screenings. Financial Literacy Classes: MICOP partners with Ventura County Credit Union to teach banking and financial management education. 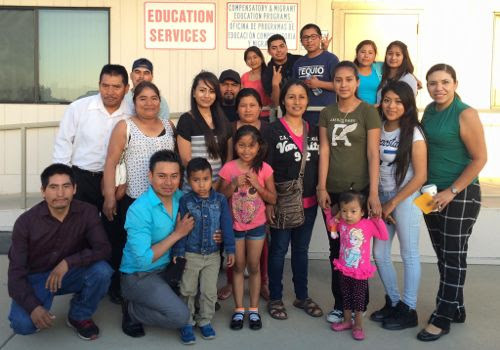 CalFresh: Our Mixteco-speaking outreach workers help families access food security. Basic Needs Support: MICOP distributes basic necessities, diapers, and FOOD Share pantry food to thousands each year. Backpack Drive: We outfit over 600 children with backpacks! MICOP’s Adult Literacy class; graduation ceremony for Mujeres Indigenas Avanzando Juntas. 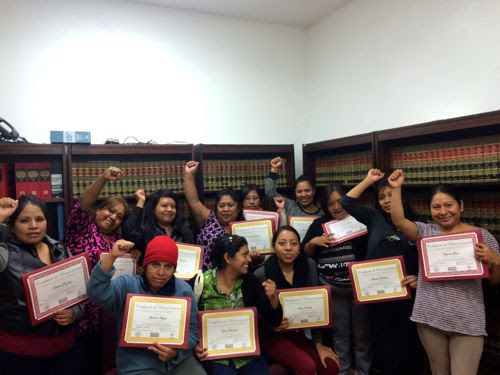 Mujeres Indigenas Avanzando Juntas: We train indigenous women to be professional interpreters and health educators. Adult Literacy Program teaches adults to read and write. Interpreter Training: MICOP has trained over 70 indigenous language professional interpreters with trainers from California Healthcare Interpreting Association. Indigenous Interpreters Network provides continuing education to indigenous language interpreters. Indigenous Women’s Health Research: We are studying women’s cancer-related health with UCLA’s Center for Cancer Prevention and Control Research Fielding School of Public Health and Jonsson Comprehensive Cancer Center. Affordable Care Access: MICOP is performing a four year study of the community’s ability to access affordable care. 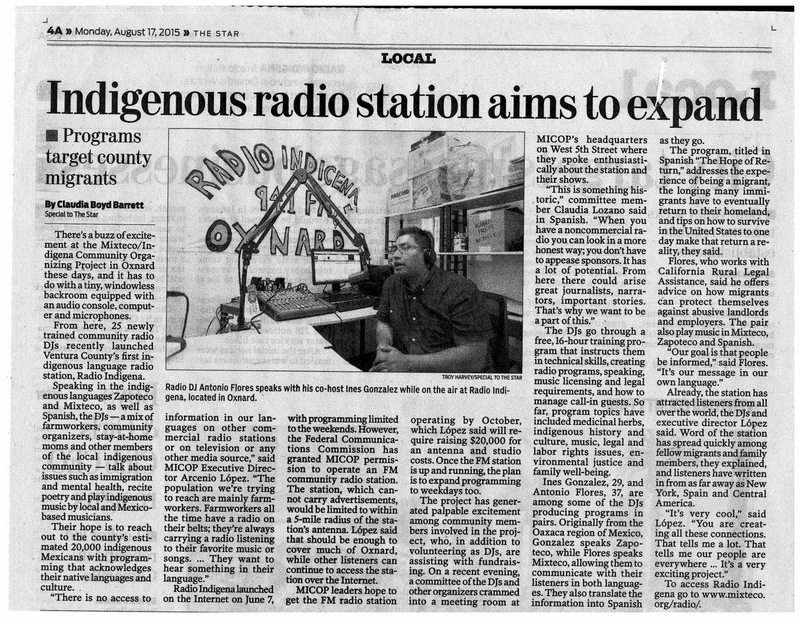 Article on MICOP’s Radio Indigena station. Read more here and here. Radio Indigena, Ventura County’s Indigenous Immigrant Radio Station: Listen to our wonderful multilingual radio programs via Internet at www.mixteco.org/radio. We currently broadcast all day Friday, Saturday, and Sunday. Plans are moving forward toward our STATION LAUNCH for 94.1 FM! If you have an Android phone, download your RADIO INDIGENA application here! 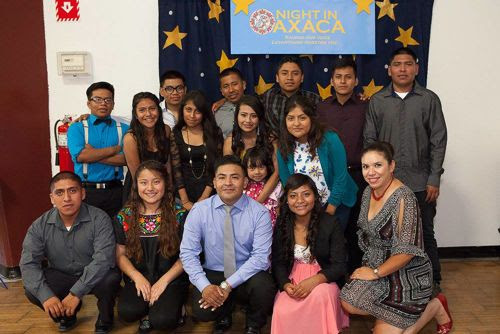 Save the date of August 20 for Night in Oaxaca 2016! Thank you for reading this list, and thank you to everyone who makes this work possible. We hope you will consider volunteering with us (more info here) or making a financial contribution (click here). We thank you for your support! No Replies to "Happy Holidays and New Year! Last MICOP Newsletter of 2015"